Music for Everyone invites advanced players to come and explore the wonderful string orchestra repertoire under the baton of an expert. 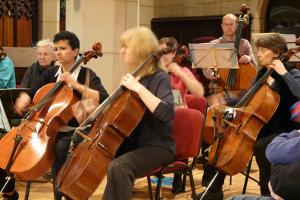 Our string orchestra workshops take place 2 times per year. String Orchestra workshops provide the opportunity to rehearse and perform exciting repertoire under the baton of expert Richard Howarth; a distinguished violinist and a dynamic conductor with a wealth of experience leading and directing orchestras.